The state of West Virginia provides good salary package to the working CNAs in this state. Average CNA salary in West Virginia was 6 percent lower as compared to the nationwide average CNA earnings, in January 2015 (as per indeed.com). This site reported that the average yearly income of these professionals was approximately $23,000. As per the U.S. Bureau of Labor Statistics, the mean salary of certified nursing assistants, in May 2013, was $22,440 per annum whereas the mean hourly wages was $10.79. Around 7,750 nursing aides were employed in the state which indicates that employment per 1000 jobs was 10.92. 90% of CNAs received less than $29,740; 10% made more than $29,740. 75% of certified nurse assistants managed to earn less than $24,680; remaining 25% earned more than $24,680. 50% of the employees were remunerated with an amount less than $21,810; rest 50% were salaried more than $21,810. 25% of CNAs were paid annual wages less than $19,000; 75% were waged more than $19,000. 10% of employees were offered less than $16,850; 90% were offered more than $16,850. According to salary.com, Huntington city offered the lowest income in West Virginia with median annual, monthly, hourly and weekly salary of $25,725, $2,144, $12, and $495, respectively. Morgantown was the highest paying city with median annual pay of $28,332 and hourly pay of $14. The following table gives a detailed view of the various job titles along with their corresponding salaries. CNA Hospice earned $30,000 per annum while CNA Rrmc made $28,000. CNA Float Pool Riverbend and CNA Neurology Riverbend made 25,000. Medical Assistant Family Practice made $27,000 per annum. Correctional Prison Facility CNA received the lowest annual income of $14,000 in WV. Due to the growing demand of healthcare services for the elderly population, the job opportunities for a CNA are predicted to expand by 21 percent in the years between 2012 and 2022, according to reports of Bureau of Labor Statistics. Long-term facilities highly demand this workforce, in order to provide quality care to the elderly aged population. 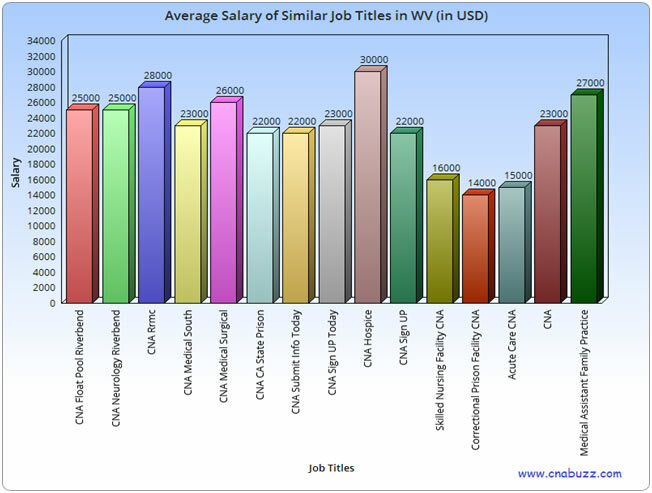 Question 1 – Can anyone suggest me some of the top paying CNA job titles in the state of West Virginia? Answer – According to indeed.com, in January, 2015, CNA Hospice tops the highest paying job title in WV with the annual income $30,000. CNA Rrmc ($28,000), Medical Assistant Family Practice ($27,000), CNA Medical Surgical ($26,000), CNA Float Pool Riverbend ($25,000), and CNA Neurology Riverbend ($25,000) are also paid well. Question 2 – At present, I am employed as a nursing aide in Wisconsin, and I’m planning to shift to West Virginia in a couple of months. How much income can I expect? Answer – If you are planning to work as a CNA in WV, you can expect an average annual income of $23,000, according to the data provided by the indeed.com.